The sleek design features a sliding USB connector, smoothly extending from the drive at the push of a thumb. The capless mechanical design eliminates the hassle of lost drive caps. The USB connector can be made ready for use with just one hand for greater convenience when speed is a must. USB 3.0 High-Speed Transmission Interface The USB 3.0 interface implements dual-channel transmission mode to deliver read speeds as high as 90MBps, and write speeds up to 40MBps, while retaining full backward compliance with USB 2.0 ports. Easy, Thumb-Activated Capless Design The USB connector is concealed in the compact body, fully protected without the need for a drive cap. A simple thumb swipe forward makes it ready to use, and the reverse motion stows the connector for storage or travel. Graceful and Minimalist Design The matte texture body is scratchproof and dirt-repellent. The UV128 comes in an elegant shape and in two stylish color schemes. The simple curves of this series make fashion more comfortable than ever. Create Your Own Personal Style The UV128 is conveniently designed for a strap so that you can easily loop a string through and connect to a keychain or a mobile phone. *Strap accessory shown in image is not included with the product. 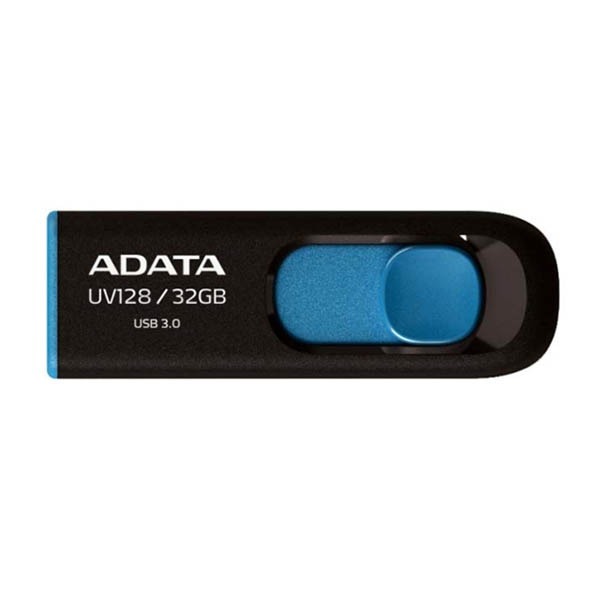 Learn more about ADATA AUV128-64G-RBE Model Brand ADATA Series DashDrive UV128 Model AUV128-64G-RBE Details USB Specification USB 3.0 Color Black / Blue Capacity 64GB Features Features USB 3.0 High-Speed Transmission Interface Now there is no reason to shy away from the higher cost of the USB 3.0 interface. 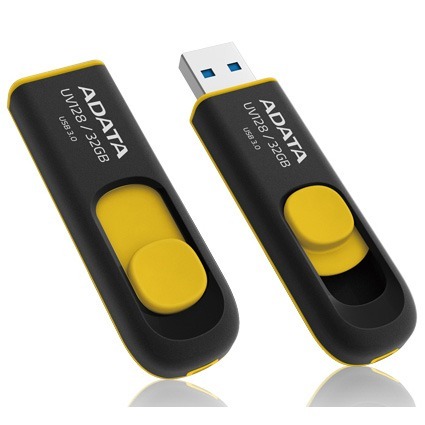 The DashDrive UV128 brings the convenience and speed of premium USB drives to budget-minded consumers. Easy Thumb Activated Capless Design The USB connector is concealed in the compact body, fully protected without the need for a drive cap. A simple thumb swipe forward makes it ready to use, and the reverse motion stows the connector for storage or travel. Graceful and Minimalist Design The matte texture body is scratchproof and dirt-repellent. The UV128 comes in an elegant shape and in two stylish color schemes. The simple curves of this series make fashion more comfortable than ever. Create Own Personal Style The UV128 is conveniently designed with a strap hole so that one can easily loop a string through and connect to a keychain or a mobile phone. Dimensions & Weight Dimensions 0.35" x 0.78" x 2.36" Weight 0.02 lb. ShippingEnjoy fast and reliable shipping when you buy your products from Newegg. Our ordering and shipping services are among the best in the industry due to short processing times and a variety of shipping methods. Your orders are packaged at one of the many local warehouses across the country, minimizing delivery times and ensuring you get your purchases as soon as possible.PaymentsNewegg has partnered with PayPal to offer you the very best in payment services. PayPal allows you to buy with confidence, knowing your payments are processed quickly and securely with state-of-the-art encryption technology. Powered by Frooition.comFrooition www.frooition.com | No-js Template | eBay design, eBay store design, eBay shop design, eBay template design, eBay listing design (ver:froo_no_js)This listing is currently undergoing maintenance, we apologise for any inconvenience caused.